Stuart Tinney has won the Australian International 3-Day Event in a tight finish while the Australian team has emerged victorious against New Zealand in the Trans Tasman competition. Riding Vettori in today’s CCI**** Olympic standard show jumping event, Tinney from New South Wales narrowly beat Megan Jones who took out second and third positions on Kirby Park Allofasudden and Kirby Park Irish Jester. Tinney’s win follows a hotly contested competition with less than one time penalty separating the top two riders, Tinney and Jones, at the close of yesterday’s cross country event. The Australian team, including Olympic gold medallists Wendy Schaeffer and Stuart Tinney and Olympic silver medallists Megan Jones and Sonja Johnson, also beat their Trans Tasman rivals, winning the title back after losing to the Kiwis in 2007 in New Zealand. In the CCI** competition, Emma Scott from New South Wales took out first place by less than one penalty point on her horse Jenbern Monyana while 17 yr old Andrew Hestletine trumped his much more experienced competitors to win the CIC**. Olympic champion and Event Director Gillian Rolton says this year’s event – marking 50 years of eventing in South Australia – has been a outstanding success. “Once again we’ve showcased Adelaide’s capacity for staging world-class events putting on three action-packed days of fiercely contested dressage, cross country and show jumping featuring Olympians and some of the equestrian world’s biggest stars,” she says. More than 110 riders entered the Australian International 3 Day Event – the Southern Hemisphere’s most important equestrian event - up from 80 riders who competed last year. 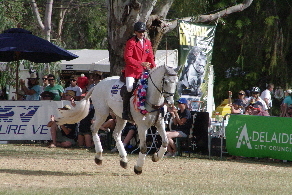 Spectacular show jumping, a challenging cross country course and dressage are features of the Adelaide event, one of only six four-star events in the world. “The Adelaide Equity Partners Australian International 3-Day Event is world class on every level. The Australian Team, including Tinney, Jones, and fellow Olympic medallists Sonja Johnson and Wendy Schaeffer won the Trans-Tasman Trophy back from the Kiwis who had prevailed at the previous contest in Taupo (NZL) 2007. All Photos are Copyright HorseOz © 2009. All Photos including the Cross Country, Show Jumping and Dressage Phases are available for purchase. To view go to www.horseoz.com/photos or contact photos@horseoz.com for more details.